Ryan Yost knew the game forward and backward. He could talk route trees and zone/man options. He could diagram plays. He could break down defensive coverages. The only issue was that almost all of Yost’s expertise was theoretical. He excelled at workouts. He stood out at camps and clinics. He thrived in practice and in the meeting rooms. He just never played much football at the varsity level. “Lots of waiting. Lots of grind,” Yost said of most of his high school career. Things have changed in a big way for the Holy Spirit senior quarterback in his final season. Yost has emerged as one of South Jersey’s most prolific passers in helping the Spartans, the No. 8 team in the Inquirer Top 25, to a 4-1 record heading into Friday’s showdown with No. 5 St. Augustine. The West Jersey Football League cross-over clash of fierce rivals is layered with subplots and has major postseason implications for both programs. It also represents Yost’s best chance yet to prove he belongs in the conversation about South Jersey’s top quarterbacks. Through five games, Yost is 76-for-132 (57.6 percent) passing for 1,022 yards and 12 touchdowns. He’s on pace to break the school record for passing yards in a season of 2,104, set in 1988 by the late and legendary Albie Mallon. “The first few weeks, I wouldn’t say he was a deer in the headlights. He wasn’t used to the Friday Night Lights,” Holy Spirit coach A.J. Russo said. “He hadn’t really played, so he wasn’t used to things going as fast they did. 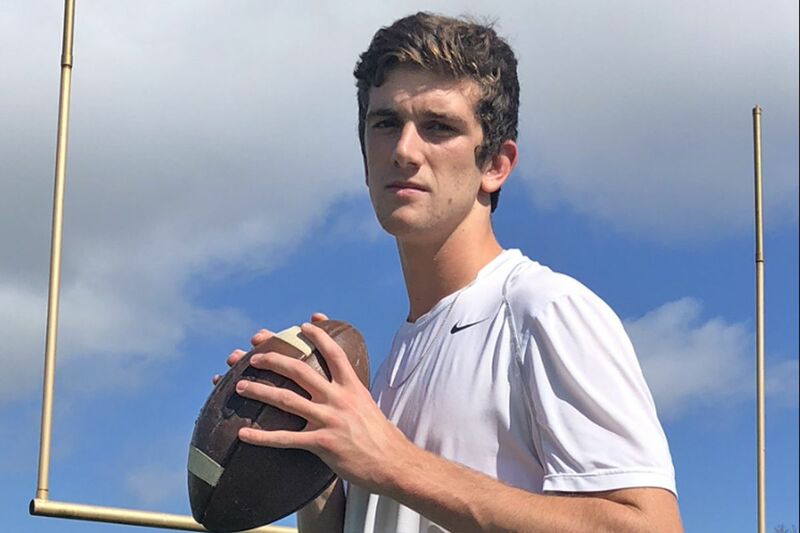 The 6-foot-4, 190-pound Yost has been a regular at college camps for the last couple of years and works out diligently with quarterback coaches. But he admits there’s no replicating live action, especially amid the trappings of the spectacle of high school football. “When it comes down to a game situation, you’ve got the adrenalin going, the fans, the bands, everything screaming. You don’t realize how different it actually is and how fast everything moves,” Yost said. “Coming out the first couple of scrimmages it was a big jump for me, a big change. Yost lives in Medford. He played youth football for the Medford Indians and spent his first two years at Shawnee, playing on the freshman and junior varsity squads for the Renegades. Yost transferred to Holy Spirit in August of 2017. For the first half of Yost’s junior year, he took a New Jersey Transit train from the Atco stadium to the Absecon station. From there, he would take a school shuttle to Holy Spirit. Since getting his driver’s license in January this year, Yost has been driving to school, taking Rt. 206 to Rt. 30 to Rt. 9, a commute of about 45 minutes from his home in Medford. “It’s not bad at all,” Yost said. Yost this season has developed a rapport with top wide receivers such as junior Ahmad Brown (25 catches, 310 yards, five touchdown) and senior Alvaro Lora (eight catches, 221 yards, three touchdowns) and tight end Isaiah Gerena (15 catches, 184 yards in two games before a thumb injury). Gerena’s projected return to the lineup this week should strengthen the Spartans’ passing game, which in turn should create more opportunities for dynamic junior running back Eli’Jah Gray (116 carries, 703 yards, six touchdowns). The highly anticipated game against St. Augustine, which features one of South Jersey’s top defenses, will mark Yost’s best opportunity yet to show he can flourish in such a highly competitive environment. He said he’s been preparing for years. Holy Spirit (4-1) at St. Augustine (4-2), Friday at 6 p.m. The rankings: Holy Spirit is No. 8 in the Inquirer Top 25. St. Augustine is No. 5. The coaches: Holy Spirit’s A.J. Russo is 25-13 in his fourth season. St. Augustine’s Pete Lancetta is 224-72-2 overall and 9-7 in his second season with the Hermits. Last year: Holy Spirit won, 22-17. Recent history: The teams have played 11 times since 2003, with Holy Spirit holding an 8-3 edge in the series. St. Augustine players to watch: Senior quarterback Chris Allen (40-for-75, 624 yards, 6 TDs); freshman running back Nasir Hill (78 carries, 495 yards); senior wide receiver Jaylen DeCoteau (15 catches, 330 yards, 6 TDs); junior defensive end Isaiah Raikes (25 tackles, 7.5 tackles for loss, 6.5 sacks). Holy Spirit players to watch: Junior wide receiver Ahmad Brown (25 catches, 310 yards, 5 TDs); junior running back Eli’Jah Gray (116 carries, 703 yards, 6 TDs); senior wide receiver Alvaro Lora (8 catches, 221 yards, 3 TDs). Streaks on line: Holy Spirit has won four straight, outscoring opponents by 136-38. St. Augustine has won three straight, outscoring opponents by 93-9.